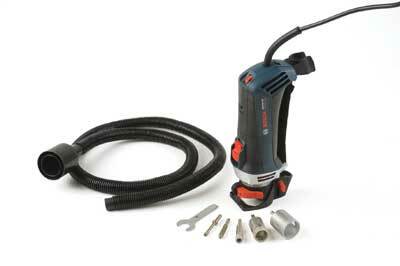 If you need to splash out on a tile cutting tool, maybe Bosch's tile router is the one for you? I remember many years ago, an editor colleague at the time said "This gadget is going to do away with all woodworking routers." Well, it never happened I'm glad to say; the tool he was referring to was the RotoZip spiral saw which is still going strong in the USA, but here at home it has transmogrified into the Bosch GTR 30 CE tile router - a tool with much more limited objectives, i.e. routing tiles. It shares the features of one of the RotoZip machines and can be fitted with diamond dry core bits. It is a 'grip' router, which means it sits vertically and you hold it in your hand with a safety strap at the back for security when working on vertical surfaces, etc. It has a push-on, flick-off switch, variable speed dial, plenty of fan ventilation and it sits in a plastic base mounting. 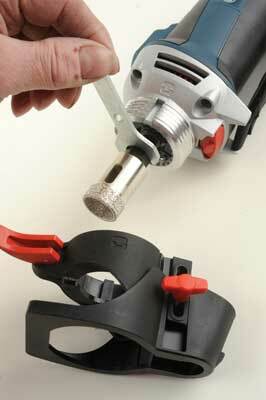 Remove the base and you have access to the collet with a spindle lock and one spanner action. The plastic base allows height adjustment and has an extraction outlet for the supplied hose and adaptor. As this isn't a plunge tool, you have to press on the base holding the machine at an angle for initial entry and then bring the router upright; then, move in a slight circular motion if you need to increase hole size. PPE is essential, especially eye protection and an effective dust mask, although you should use extraction too. This is a 'second fix' tool for bathroom and kitchen installers and plumbers needing to fit additional pipework, shower fittings, cisterns, etc. It works well, just as intended, but it's a shame you can't fit other cutter bits for woodwork or drywall use such as making cutouts for switchboxes. 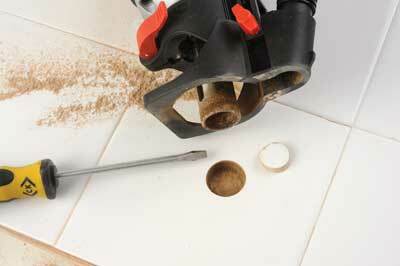 Using the 25mm diamond core bit made fast work of cutting through a standard white tile without any fuss at all. This is definitely the tool to use when nothing else will do it.